Marcello Lippi has stated that he is concerned about China’s performance especially in their friendly with Qatar. China fielded what could be considered one of their stronger lineups while at the same time Qatar lined up with mainly U23 players in their side. Even though China put a strong side out against Qatar, they only managed two shots in a match that was dominated by Qatar. With the Asian Cup only 4 months away, Lippi doesn’t have much time to get the side sorted out before the main event in Asia starts to rumble. China produced a dismal performance away to Qatar but picked it up a bit against Bahrain. Could that be down to Bahrain being the lower ranked side of the two? China lost 1-0 in Qatar, but even though they produced a better attacking display in Bahrain they still failed to win as the game ended in a 0-0 draw. 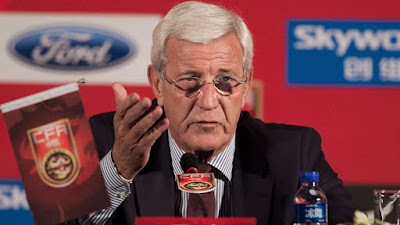 China and Lippi will need to drastically up their game if they have any aspirations of doing well at the Asian Cup. With the Asian Cup being an expanded tournament, the bigger sides in Asia should have no problems getting past the group stage, but unless they really perform well they won’t get much further than that once they end up playing the dominant sides in Asia. China is one of those sides which I would currently consider a middle of the road team, they often dispose of the smaller Asian nations easily enough but when they come up against the bigger sides like Japan, Iran etc then they struggle to defeat them, which they’ll have to do at some point if they want to get to where they want to be. In my opinion, the amount of money China has been throwing at developing football means they are likely to want to see improvements at each tournament. For the amount of money spent, slight improvements each time are the least they can expect. Football development obviously doesn’t happen overnight and it can take years for the youngest players of this generation to start coming through, but other things shouldn’t take so long like being tactically better, or attacking better, defending better. These kinds of things should improve quickly under top-level coaches and managers. China should be hoping to at least get to the quarterfinals in the Asian Cup, anything other than that should be considered as a failure. China is in the Asian Cup Group C with South Korea, Kyrgyzstan and the Philippines.